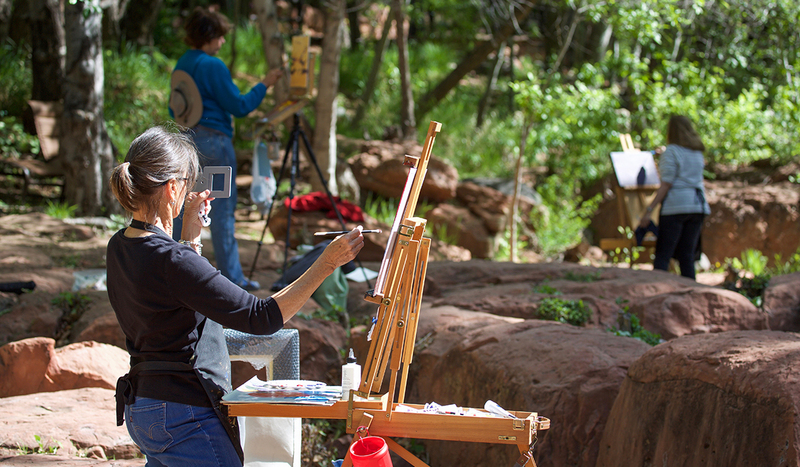 Art Curator at L'Auberge de Sedona and owner of Goldenstein Gallery, Linda Goldenstein, invites the community to participate in completing plein air paintings or drawings in any medium, along the banks of Oak Creek at L'Auberge de Sedona. Artists will set up along the L'Auberge creekside and in addition to the creek, rocks, trees, ducks, etc., a live model* will be posing, as well! Artists can begin working upon arrival and stop at 11am. Finished works may be displayed on the creekside lawns using artist's own easel and they may be for sale. The Arts Center will present an award at 11:15am and will process any sales from 11-11:30am. As parking is very limited at the resort, Red Rock Magic Trolley will be shuttling artists and the public from the Sedona Arts Center lower parking lot to nearby L'Auberge resort, back and forth from 8am to 1pm, leaving plenty of time after the event for lunch at Cress on Oak Creek, the lovely creekside restaurant at L'Auberge. The event is open to painters and drawers using oil, acrylic, watercolor, pastels, graphite, charcoal, colored pencil, etc. To participate, members of the Sedona Arts Center register for free to paint or draw, non-members pay a $10.00 per artist registration fee (not including model's fee if applicable). Artists must provide all their own materials; portable easels, panels, frames, etc. Artists will price their own work using three-part receipts provided by the Sedona Arts Center. Sales will be processed by the Sedona Arts Center with artists receiving 60% of sales from the event. By registering you agree to these terms. Only registered artists may paint or draw at the event.